With the 2019 Monster Energy Supercross series right around the corner, riders without a factory team are probably working on the logistics of their budgets for the upcoming season. When we see these same riders roll out at A1 things appear simple: show up and race, right? Not exactly! 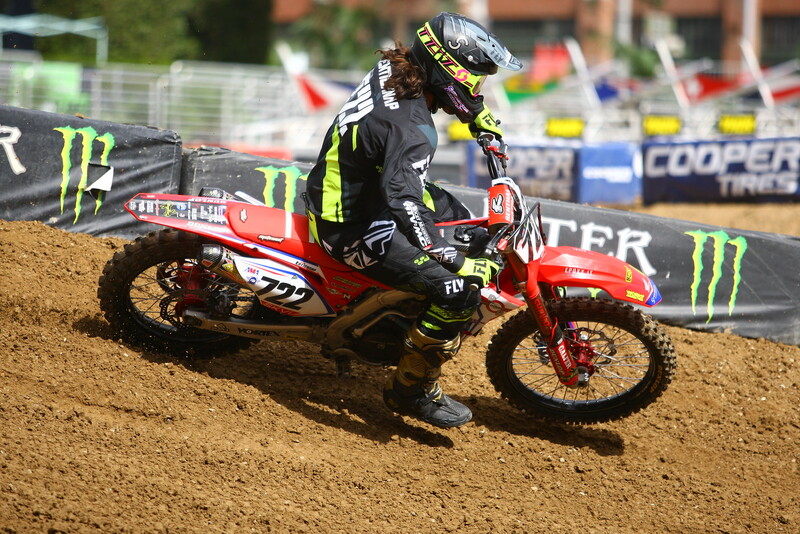 Take Tyler Enticknap for example, a privateer racer in his mid-20’s. History will tell us Tyler has little or no chance of ever making a significant amount of money racing. So why does he keep chasing his dream day in and day out? Without asking him I can answer this question. His love of the sport and his belief that he can defy the odds and become a superstar. Nobody reaches the pinnacle of anything without people telling them they can’t or won’t reach their goals along the way. All of these guys have made it this far by tuning out negativity and believing in themselves even when the odds and history are stacked against them. How does a guy in his mid 20’s keep chasing the dream logistically? Purse money provides only a fraction of the expenses required to go racing. Tyler is part of the TPJ (The Professional Journey) program, a program founded by Ted Parks to help privateer racers compete with factory racers. Ted provides transportation, pit setup, fuel and a few other amenities required to go racing. Racers pay TPJ for this service, but trust me, Ted isn’t getting rich off these guys. This is a labor of love. The service TPJ provides is very important to the sport and helps provide a competitive field at each round. The reality of racing is many supercross racers have jobs during the week. Ben Lamay works for Monster Energy stocking shelves during the week. TPJ also hauls Ben’s motorcycle which allows him to fly in and out of each round while maintaining his steady job with Monster Energy beverage. Unfortunately, I don’t see most riders being able to quit their day jobs anytime soon. In fact, I would encourage more guys to work or go to school during the week, but not everyone has the freedom the TPJ program allows. My solution is easy; promoters need to provide a service similar to the TPJ program at no cost to the riders. Now before everyone loses their mind and tells me how much it would cost to provide transportation similar to the TPJ program, let me remind you promoters and series sponsors shelled out two million dollars at Monster Energy Cup. Let me also remind everyone, at this very moment, quite a few Arenacross teams have trucks that will not be used for the 2019 season. If promoters were to buy the trucks and run an in-house program, no problem. If they want to hire an outside service like TPJ, that would work fine too. When everyone calls for additional purse money, the majority of this extra money goes to the elite riders; the rich get richer. Riders who finish better deserve the big money, but there needs to be more opportunity for talented riders to develop their skills. Take what could be a purse money infusion and create this program. We would see more riders develop their skills later in life. Also, a guy like Dean Wilson wouldn’t have to worry about finding a truck to attend the races in 2019. He could put his bike on the promoter’s truck while waiting for a fill in opportunity. Promoters could also qualify riders through previous year results, start at the champion and go down offering spots. This leaves racers working on their craft more than their logistics. This also provides guys like Tyler Enticknap a way to use their actual prize money for living expenses. Most importantly this provides promoters with a stronger and more reliable rider base, a win for promoters and a win for riders chasing their dreams. A Supercross series that develops talent instead of adding to the wasteland of 2-year professionals is an important investment. I imagine none of the series sponsors would complain about a couple semis traveling the country with their names on the side of a tractor trailer. Allowing organic growth of the supercross middle class would create another level of professional. Currently there is a huge gap between the true privateers and factory riders. A program like this would create stability in the supercross field. Riders will be a part of the series for longer and the fan familiarity would help sell tickets and add stability to the series. This works because it benefits both the promoters and the riders, everybody makes more money and, in the long run, who doesn’t want more money? Get well soon, Weston Peick. We send our best! Follow me at chriscooksey61 on Instagram and Twitter and be sure to like @cookseyshardtruth on Facebook.